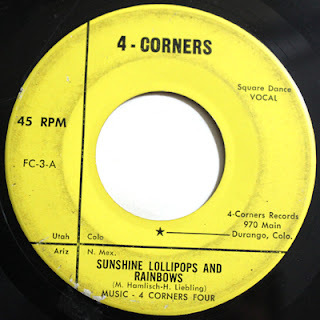 I'm usually not a fan of square dancing records, as they all seem to sound the same to me - that is, until I heard this happy little single from the 4 Corners Four, out of Durango. Love their take on this Lesley Gore hit (instrumental on the flip side). Listen to a sample of "Sunshine, Lollipops and Rainbows"
Pressed on the 4-Corners label (not to be confused with the Kapp Records subsidiary). I came up empty on any additional information. No notation on a year, and there is absolutely no mark on the runoff. Address shows 970 Main Street, which is now home to the La Plata Abstract Company.